Jon McDonald has revealed his admiration for Seaham Red Star after it was announced he is to leave the club to become assistant manager at Evo-Stik NPL East leaders Morpeth Town. 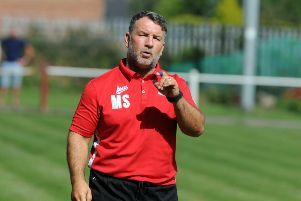 The former Blyth AFC and North Shields manager will be alongside Mark Collingwood in the Red Star dugout for the final time tomorrow when they face Newcastle Benfield at Sam Smith’s Park. He will then head back to the club where he began his Northern League coaching career as assistant manager to Nicky Gray. He helped the Highwaymen to promotion into Division One in 2013, before leaving to take up his first managerial role at West Allotment Celtic. That decision to leave Red Star brings an end to McDonald’s short stay at the club but he admitted that he had to make a tough decision before deciding to leave. “I’ve had a brilliant experience at Seaham Red Star,” explained McDonald. “I had so much time for the club before I joined and that has only been enhanced by my time here. It’s a friendly club and I want to continue helping where I can. “We have improved recently and I am sure we will continue to do that in the future. “Last weekend’s defeat against Ryhope was a blow and we do need to find some consistency. “That will come once the new signings have settled in because sometime it can take time for things to gel. “It’s been a tough decision to leave and it isn’t one that I have taken easily. McDonald’s time at the Ferguson Repairs Stadium has seen a number of his former players joining the club. Former Blyth AFC duo David Robinson and Michael Chilton both moved to Red Star, along with Washington’s highly-rated midfielder Nick Allen. In his four games working alongside Collingwood, Red Star picked up five points and gained their first league win of the season at Stockton Town. McDonald paid tribute to Collingwood and the club’s long-serving secretary Dave Copeland, describing the duo as “real football people”. He told the Echo “The big thing that struck me when I joined the club is the amount of hard work that is put in by various people at the club. “It was new for me to come and work South of the Tyne but it’s such a warm, friendly club that I felt welcome as soon as I walked in. “Colly is a great bloke, he says it how it is and I appreciate that in someone. “The players like working for him, that’s a skill in itself and it tells you everything about him. “Dave is so passionate about Red Star and he’s had the club at his heart for a long time. 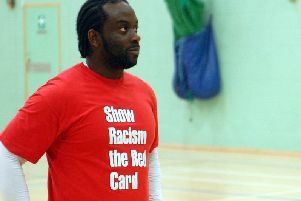 “It is at the centre of everything he does and he is essential to the way Seaham Red Star functions. “They are both true football men and I’ve enjoyed working with them. Red Star head into tomorrow’s game at Benfield sat third from bottom in the Northern League Division One table, eight points clear of basement club Penrith.